Devin Davis opens the door to his belowground apartment in Wicker Park. "This is where the magic happens," he says, leading the way through three dim rooms littered with beer bottles and overflowing ashtrays and cluttered with well-loved guitars, drums, keyboards, amps, cables, and mixing consoles. Between 2001 and 2003 Davis spent much of his time here alone, working on his album Lonely People of the World, Unite! He played almost every instrument, and when the disc came out in the fall of '04 it was on his own label. But despite its minuscule production budget and almost nonexistent PR push--for the first six months Davis just mailed copies to people himself--over the past year the album has become one of the Chicago indie scene's surprise successes. "Realistically, I was hoping to sell a couple hundred," Davis says. 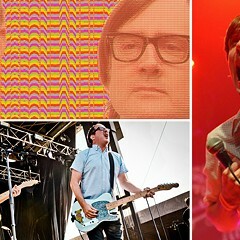 But Lonely People has attracted widespread praise from bloggers and reviewers, even making a convert of Death Cab for Cutie front man Ben Gibbard. In the process it's sold almost four thousand copies. Sonically the album is a dazzling, lively mosaic of bits pillaged from the British Invasion and the homemade psychedelia of the Elephant 6 collective. Lyrically it's a loose thematic suite about loneliness, but the sad, personal songs are leavened with escapist silliness about outer space and giant spiders. "It has a lot of tongue-in-cheek moments," says Davis. "I didn't want the whole 'lonely people' concept to be taken too seriously." Born in Clinton, Iowa, in 1975, Davis was (obviously) an only child. He took piano lessons and learned to play saxophone and drums. When he was 12 his family moved to Jacksonville, Florida, and in eighth grade, besotted by the sounds of Superchunk and Nirvana, he picked up the guitar. In college in Florida, Davis formed his first band, Irving, which borrowed heavily from Sonic Youth and Dinosaur Jr. They released a single but had trouble holding on to a drummer, and soon Davis turned the group into a solo project, renaming it Irving Philharmonic and putting out a home-recorded album. By 1999, though, he'd decided the Jacksonville scene was a dead end. "Having grown up in Iowa, I'd been to Chicago a bunch," he says, "and I liked a lot of bands from the city, so I thought, 'I'll move there.'" But if Davis had hoped he'd stumble effortlessly into the open arms of Chicago's music community, he'd be disappointed. "It was tough moving here," he says. "I didn't know anybody. It wasn't a mad flux of meeting people. I'm not the best at doing that anyway." He spent a lot of time alone, wandering the sidewalks. "I kinda imagined that maybe a lot of the other people I saw were in the same boat as me, sorta lonely and aimless." He worked temp jobs and used his spare time to rediscover some music he'd left behind as a kid, especially the Beatles. "I'd been more into experimental music like Glenn Branca, and the simplicity of the Beatles--at one point, I might not have taken it as seriously," he says. "But going back and listening to those records, I realized how hard it was to do what they did. The idea of melody, the relationship of a vocal melody to a chord progression, that just became more prominent and interesting to me." In 2001 Davis landed an engineering job at Acme Studio on Belmont. "They were looking for someone to record the books on tape and the other stuff that no one wanted to do," he says. Before long he was also recording bands (including Born Heller and improvising outfits like Aram Shelton's Arrive and Kyle Bruckmann's Wrack), and because he had free access to the studio during downtime he began tinkering with a few ideas of his own. In September of that year he recorded drum tracks for two songs on Lonely People, then moved the project to his home studio, where he'd continue to work alone for the next two years. "Some of it was out of necessity, but I love working that way," he says. "I love playing all the instruments. I like putting the mikes up. The process of recording is fun. Plus, I'm kind of predisposed. . . . I spent many, many hours alone as a kid making flip books or just doing stuff by myself." The first lines of the album's first song, "Iron Woman," are a clear reference to this period: "It's hard to live in a basement / And not get carried away," Davis sings. Davis returned to Acme to finish the mixing and master the album with his friend Jeremy Lemos, the head engineer at the studio. He got the work done just a few days before Acme closed its doors in the summer of 2003. "So I finished the record, but I didn't really know what I had to do to get it out," he says. He shopped the disc to indie labels for nearly a year and finally decided just to press a thousand copies himself. In fall 2004 Davis released Lonely People on his own Mousse label, and in short order positive reviews started to appear (including one in this column). But it was the Internet that really helped the album take off--particularly MP3 blogs like Music for Robots, Said the Gramophone, and 75 Minutes. "The blogs have been huge," he says. "I was totally unaware of how blogs work, how they network with other blogs and all that. That's been a big help, because there haven't been any ads or anything." The Internet buzz helped Davis pick up a publicist-slash-manager at Fanatic Promotion in LA and a national distribution deal with Nail. In March 2005 he reissued Lonely People, and it got written up in Entertainment Weekly and Salon. It was during this time that Ben Gibbard discovered the record through an online rave, and he's been on a one-man crusade ever since, praising it in Wired, Magnet, and Harp. Several labels have expressed an interest in Davis, but he's made no commitment yet. He's currently focusing on his next album, which he hopes to release in early 2007. He's scheduled to start recording with Lemos in March, but he expects he'll engineer most of the disc at home himself ("It's such a hard habit to break," he says). A solo version of a tune from the forthcoming disc will appear in May on a Kill Rock Stars singer-songwriter comp, alongside tracks by Sufjan Stevens, Laura Veirs, and the Decemberists' Colin Meloy. Since Acme folded, Davis has worked odd jobs, including one as a graphic designer and another with a caterer. He severed ties with his publicist in January and his plans to play South by Southwest are up in the air, but he's no less determined to make music the center of his life. "I finally feel like I'm on the right path, at least," he says. "I dicked around for a long time trying to figure things out musically, but what I want to keep doing is what I'm doing now." Davis is performing at the Hideout every Wednesday in February. This week he'll be backed by a full band.